For now, know that Gainesville is a cool place. It’s loaded with history, culture, a big arts scene and two state-supported institutions of higher learning — Santa Fe College and the University of Florida. Businesses, student enrollments and research centers are multiplying here, and so are the number of new Gainesville residents. 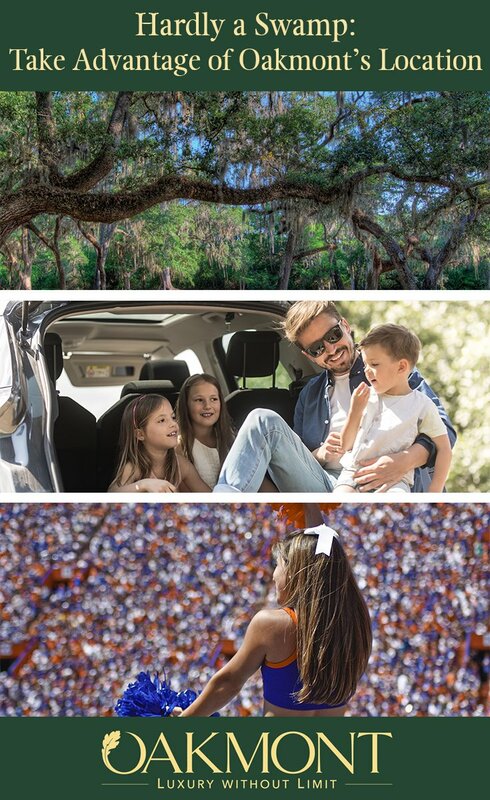 Whatever your reason for moving to Gainesville, Oakmont is our master-planned community on Gainesville’s southwest side. It boasts a flexible range of floor plans and home sites, and amenities that’ll make you the envy of any new acquaintances you meet, who might live elsewhere. Swamps really do exist in Florida — there are some gorgeous ones near Gainesville — but they’re awesome natural resources, not places to avoid. Want to find a real Florida swamp? Visit, say, the Flatwoods Conservation Area opens in a new window or Gum Root Park opens in a new window (both city parks), and see for yourself. In fact, if you’re an outdoor enthusiast, you picked a great place to move to. Nature and recreation are big draws in north central Florida. Numerous parks, wildlife refuges and conservation areas dot Alachua County. Some are quite significant, such as Paynes Prairie Preserve State Park opens in a new window, a U.S. Natural Landmark. It’s not a real swamp. It’s Ben Hill Griffin Stadium, home of the UF football team. Given that “Gators” is the nickname for all UF sports teams, the stadium is familiarly and dearly called “the Swamp,” in these parts. If you’ve never been to a Florida home game — or any college football game — you should go at least once. The Swamp is nearly always filled to its 88,548-seat capacity, as is the UF campus with pregame parties and tailgaters. It’s a boisterous, energetic atmosphere, and well worth hauling the coolers, grills and paper plates to your municipal or campus parking lot of choice, to join. Then go to the Swamp and watch the Gators play! Or, kick back in your new Oakmont home with its billboard-sized TV and watch the game in comfort, without traffic and parking hassles. Want an even better suggestion? Host a community tailgate party. Use the public meeting and event space in Oakmont’s 6,000-square-foot Residents Club. Plan in advance, of course, to make sure it’s available and that your tailgate party won’t conflict with another on-site event. Have the pregame spread catered, or recruit neighbors’ grills to make it a giant community barbecue. Let the kids’ garage band down the street provide pregame entertainment. If the Gators chomp their opponents early, you’ll have all the great facilities at the Residents Club opens in a new window — resort-style swimming pool, tennis courts and event lawn — for distraction.